My Brain on Books: THE UNLIKELY ADVENTURES OF MABEL JONES by Will Mabbitt - Guest post and giveaway! 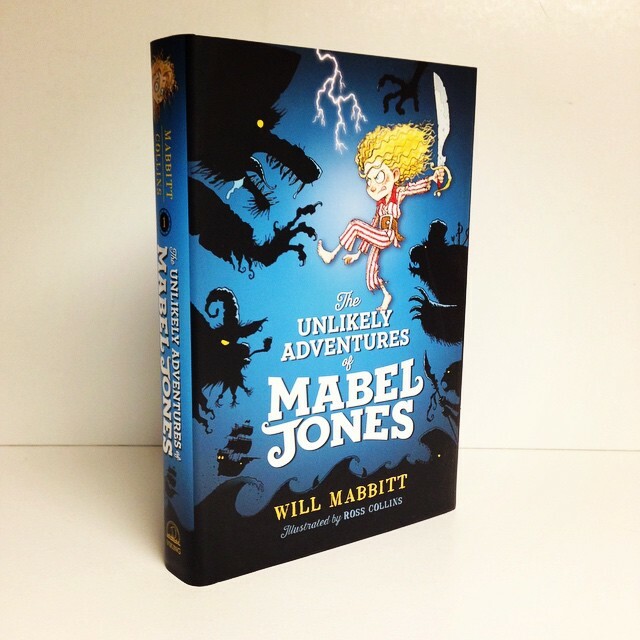 THE UNLIKELY ADVENTURES OF MABEL JONES by Will Mabbitt - Guest post and giveaway! Synopsis (from the publisher): Have you ever picked your nose? Have you ever picked your nose and EATEN IT? Have you ever picked your nose, eaten it, and, by doing so, opened a portal to a world run by PIRATES? Why I recommend it: I didn't expect to like this book. It really didn't seem like my cup of tea. Then I started reading. And before I knew it, I was giggling, then snorting, then laughing out loud. A rip-roaring, snarky adventure with a lovable cast of characters. I was most impressed by Will Mabbitt's imagination. And I adore the drawings by Ross Collins. This will appeal to kids who like quirky books and lots of adventure and laughs. Bonus: Visit the website (http://mabeljonesbooks.com) for a terrific trailer, the cast of characters, and some super-fun activities. Seriously, allow some time to explore. You can even learn how to make invisible ink! And now, for a special treat, Will very kindly wrote an exclusive guest post about his writing process and where he gets his ideas. When I get an idea it gets stored somewhere in my head. Then I usually forget it. Sometimes though, the idea will pop out a bit later and I will start writing it down properly. I begin by finding somewhere to write. The Unlikely Adventures of Mabel Jones was written entirely on my daily train ride to and from London Bridge station. Now I mainly write in cafes. I’m writing this in a cafe as we speak. I’ve been here for hours but I’ve only bought one coffee. If the barista gets annoyed I will grudgingly buy the cheapest slice of cake that is available. Sometimes I know that the words I write will never be used - maybe even this sentence right now will get deleted. If you are reading this then I guess it has made the grade. Sometimes I delete a whole days work. This makes me sad but I know that I need to do this to get to the days where I actually like what I write. After the first draft is done I wait for as long as I can manage then print it out and read it to myself. There are usually loads of mistakes. I don’t worry about mistakes when I am writing the first draft. I just want to get to the end. Then before I show it to anyone I start to edit it. I love this part as every single thing I do makes the story better. If there’s enough time I’ll also show it to my older brother. He writes snarky remarks about punctuation and grammar in the margin. He is annoyingly helpful like that. Sometimes I’ll show it to my writing group. They are a lovely bunch who are great at spotting things that maybe I am too close to see. In the old days that would be the end of the process. The story would get saved on my computer and never read again. Something different happened with The Unlikely Adventures of Mabel Jones. Someone at my writing group showed the first three chapters to an agent. The agent liked it and showed it to a publisher. The publisher liked it and then it became a book. Now when I’ve finished something I always show it to my agent to check that it doesn’t have anything in it that will enrage my publisher. After all the swearing and violence has been taken out I send it on to my editor. Then I wait. The waiting is terrible. I haven’t been a professional writer very long and I am afraid they won’t like what I have written. Sometimes I think maybe they have got me confused for a different Will Mabbitt and commissioned the wrong book. Sometimes I imagine them all in a meeting laughing at how awful it is. Last time I was waiting for a manuscript back, my wife told me she dreamt I had received an email from my editor which just read: NOT FUNNY. Comments like that don’t really help. Luckily my editors are really nice and after a brief period of huffing, puffing, and moodily glaring out to sea I usually agree with their points - most of which are fairly minor. Then I change it for the last time. Then it’s done. I love writing. I think I am very lucky to be able to do it everyday. Thank you so much, Will! You are lucky to do what you love. Now for the giveaway: One lucky reader will win a hardcover copy of The Unlikely Adventures of Mabel Jones. To enter, you must be a follower of this blog and you must comment on this post. International entries welcome. If you spread the word via Twitter or Facebook (or other social media) please let me know and I'll give you extra chances for each mention. This giveaway ends at 10:00 pm EDT on Saturday July 11 and I'll announce the winner on Monday July 13, 2015. Sounds like a fun book. And Will's wife must have a lot of patience when Will is thinking about his next story. I thought the same thing, Natalie! I'll have to admit some of Will's writing methods sound familiar. This new one sounds like a great read-aloud. Even my mom might like this one since her real name is Mabel! It would make a terrific read-aloud, Greg. Especially if you're good at sounds and voices. I'm always looking for a funny book to recommend. This one looks great, and what an appealing cover! The cover's perfect, Rosanne, because it hints at the adventure and wackiness to come. I do like funny, but when I read the synopsis, I was busy gagging. But then I thought how much my grandkids would love a book like that, and after all, they are the audience, not me. Thanks for this post. It was very interesting. And thanks for the chance to win. I do think my grandkids would love this and they could taunt me by reading booger passages aloud. They'd love that. My first reaction was the same as yours, Rosi. But an odd thing happened when I started reading. It's truly giggle-inducing. Yes, your grandkids would probably love this. Good luck! Great guest post, Will, and thanks for the giveaway! Oh ha ha ha, Suzanne. I didn't know about the poop jokes. Yes, this is a lot of fun to read. I normally don't like pirate books, but this sounds so hilarious! The tone reminds me of The Whole Nother Story series. I really enjoyed Will's guest post. That made me feel so much better to hear he deletes a lot of what he writes each day to get to the good stuff. Inspiring! I enjoyed Will's post too, Jenni. It's always great to hear that another writer makes mistakes. But he obviously knew what to delete and what to save! Consider yourself officially entered, Cindy! Thanks. I loved reading about Will's writing process. Yes, it did not sound initially like something I would like--but I really enjoyed the author interview. And the cover was great, too. One more for the TBR pile. Glad you enjoyed Will's guest post, Michael. It's great fun, Erik. Good luck! Great interview! This is an author that knows how to enjoy the process of writing! Sounds like a fun story with a great voice. It really is a fun story, Andrea.